This ONLY applies to items that are IN STOCK please click here to learn more about pre-order, out-of-stock, and discontinued items. For orders of in-stock items placed by 11:59 AM EST Decmber 22, 2014. Orders to Puerto Rico, US Virgin Islands, Guam, Marshall Islands, Northern Mariana Islands, Samoa, APO/FPO/DPO are excluded. Overnight service not available for PO Box deliveries. 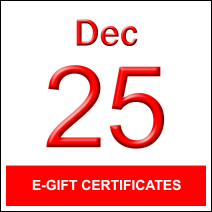 E-gift certificates requires a valid e-mail address. - Some Studio animals can only be shipped by freight service; these items may not be shipped via standard shipping, 2nd day or overnight service. Please check the product description. You may contact customer support via e-mail or phone for additional information. - Steiff USA is not responsible for delays due to weather, delivery carrier factors, customer error, holiday-related delays, international customs regulations, or any other unforeseen factors. Steiff USA is not responsible for lost shipments due to incorrect address provided at the time the order was placed.